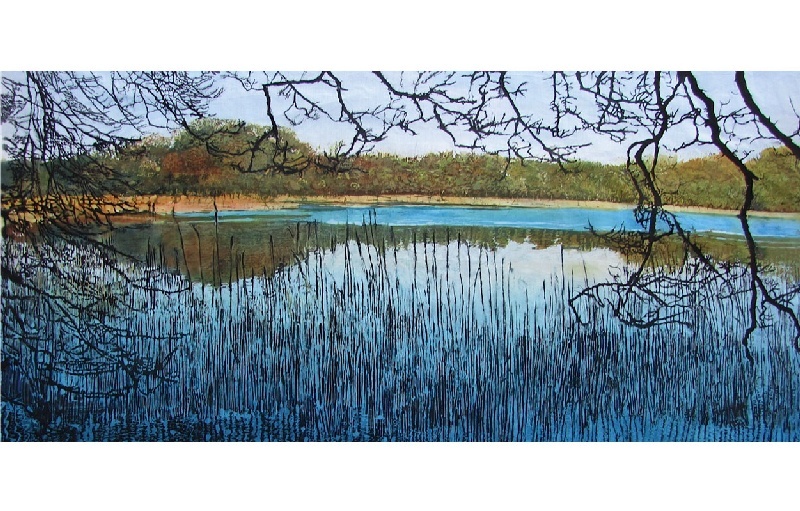 A batik painting of the reeds and reflections of Loch Arthur in the S.W. of Scotland. This was very close to where I spent my childhood vacations. Recently when I revisited my childhood haunts, I stopped by the loch to take some photographs. There was a calmness and serenity about the loch. I loved the reeds and branches that framed the scene. I was inspired to create a batik painting of it. This batik was chosen as one of the finalists in the 'International Artist' magazine competition - 'Seascapes, Rivers and Lakes'. As a prize I had a whole page in the February/March 2014 issue of the magazine, featuring this painting, a description of my inspiration and how I created the batik. I am really proud of my achievement, as I am probably the first batik artist to have been chosen as a finalist! The 'International Artist' magazine is sold throughout the world and so is a wonderful showcase for a variety of media especially my figurative batik. I sold my first version of 'Reeded Loch'. Some years later I decided to do another batik of this loch. It took me three months to complete. The measurements of the second 'Reeded Loch' is 1.20m x 0.70m. It is framed with UV non-reflective glass and has an acid-free mount/matt. Original Batik painting - 1.20m x 0.70m plus frame.